What’s a school gym without its floor? Nothing! When the school’s gym floor needs to be re-modeled all sports activities are forced to stop (unless outdoor courts are available). The faster the new floor is installed, the quicker all sports activities can resume. Remodeling of anything gets frustrating when you have unrealistic time expectations. A 10,000-sq. ft. gym could take up to 6 weeks to remodel but you need to consider the time it takes to tear down and clear the old floor too. Also, keep in mind the conditions of the gym itself – they may not be ideal for a new floor, additional repairs may be needed. If you’re working with more than one contractor for your gym remodeling (lighting, wall-padding, setting up hoop, etc), you need to ensure that all parties are coordinating with each other. The markings on the gym floor aren’t to be taken lightly. Instead of guessing what colors the game lines need to be, pick out Pantone colors when deciding what color to paint the floor. Gyms are kept at a certain temperature to make sure people don’t get too warm but also for the sake of the floor. The environment in the gym needs to have the right temperature and humidity levels for installation or else the process can take longer. People shouldn’t be walking around during floor installations for safety reasons but also because it interferes with the process, especially during the final days when sealing, game-lining and finishing are happening. We at Sport Court South Florida are experts at sports flooring. You can choose from a variety of indoor floor surfaces according to your needs and budget. Custom-made volleyball and basketball courts are our specialty. 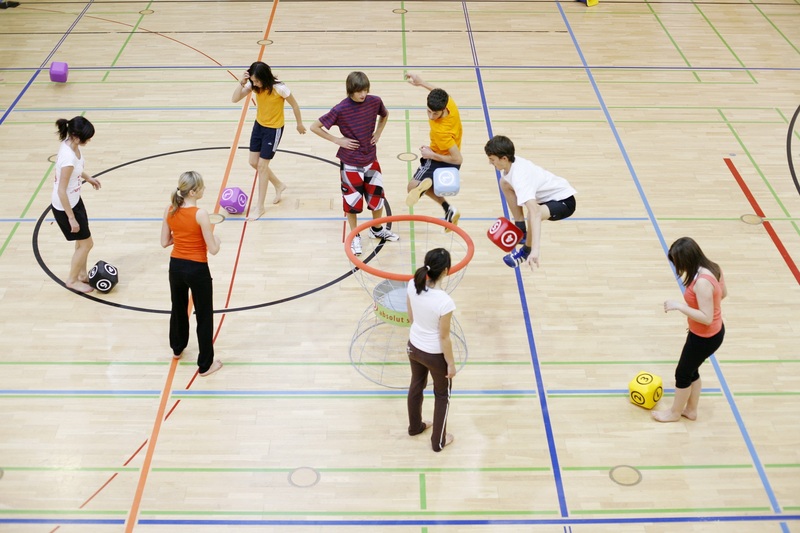 We also provide low-cost, floor resurfacing for elementary and middle-school gyms. You don’t need to hire other contractors because we also offer high-quality accessories including hoops, nets, lights and fun packs consisting of racquets, balls and other school-gym gear. We’re your one-stop shop for all your school-gym needs. Are you in Florida and looking for affordable sports courts builders? Look no further, we’re at your service! Call us at 1-800-313-2944 for a free consultation. © Sport Court South Florida. All Rights Reserved.